One of the most bizarre looking new movies of 2019 is “Velvet Buzzsaw,” a horror satire starring Jake Gyllenhaal about an art critic who discovers the paintings of a newly discovered artist are haunted and capable of murder. Funnily enough, the concept has something in common with another satirical classic, “Ghostbusters.” Ivan Reitman’s movie is also about a haunted painting, that ugly looking Vigo the Carpathian that comes to life and tries to take over the world. Human sacrifice, dogs and cats living together … mass hysteria! That sort of stuff. Well getting in the “Ghostbusters” spirit after news dropped yesterday that Ivan’s son Jason Reitman is making a secret “Ghostbusters” film, Funny or Die has mashed up the latest Netflix sensation with the Bill Murray classic for a pretty convincing fake trailer. Suddenly Gyllenhaal’s line in the film, “something goddamn strange is going on” sounds a bit more ridiculous when the “Who you gonna call” theme is playing over the top of it. “Velvet Buzzsaw” is written and directed by Dan Gilroy and also stars Rene Russo, Toni Collette, John Malkovich, Daveed Diggs, Billy Magnussen and Natalia Dyer. It lands on Netflix Feb. 1. Watch the fake mashup movie trailer from Funny or Die (via Entertainment Weekly) above. After months of vitriol, the new "Ghostbusters" film is finally arriving in theaters this week. Ideas for a third installment in the legendary '80s franchise were bandied about for many years, but to the surprise of many -- and the anger of some -- Columbia Pictures settled on a reboot with an all-female team. TheWrap looks back at the turbulent return of cinema's most famous parapsychologist agency. March 2014 -- Following the death of original "Ghostbusters" cast member Harold Ramis, director Ivan Reitman bows out of his plans to direct a third film in the franchise. Plans for a "Ghostbusters 3" had long been held up by Bill Murray, who kept declining offers to return. August 2014 -- Reports surface that "Bridesmaids" director Paul Feig entered talks with Sony Pictures to replace Reitman, and that "Ghostbusters" would be rebooted with an all-female cast, with Reitman as producer. Both the reboot and Feig's signing are confirmed two months later, with the cast change immediately receiving condemnations on Twitter from people who apparently think women can't hunt ghosts. January 2015 -- The cast for the all-female "Ghostbusters" team is unveiled: Paul Feig collaborator Melissa McCarthy, her fellow "Bridesmaids" star Kristen Wiig, and "Saturday Night Live" cast members Leslie Jones and Kate McKinnon. March 2015 -- Reports attach Channing Tatum and "Captain America" directors Joe and Anthony Russo to another "Ghostbusters" project with an all-male cast. Reitman denies the reports, saying Feig's project is the only "Ghostbusters" film moving forward. June 2015 -- "Thor" star Chris Hemsworth joins the cast as the Ghostbusters' secretary, Kevin. The role is a parallel to Janine Melnitz, the receptionist played by Annie Potts in the original film. July-September 2015 -- Shooting for "Ghostbusters" takes place in Massachusetts and New York. Paul Feig tweets a photo of the redesigned Ecto-1, the Ghostbusters' legendary car. August 2015 -- During filming, the main cast pays a visit to Tufts Medical Center in full costume. A Facebook post from the hospital with photos of the visit is filled with comments attacking the film and its cast, causing Tufts to post an additional post with a reminder that "any comments with profanity would be deleted." September 2015 -- Bill Murray and Sigourney Weaver are confirmed to appear in cameo roles in the new film. March 3, 2016 -- The first "Ghostbusters" trailer debuts on YouTube. As of this writing, the trailer has over 900,000 dislikes on YouTube, making it the most disliked movie trailer in YouTube history. 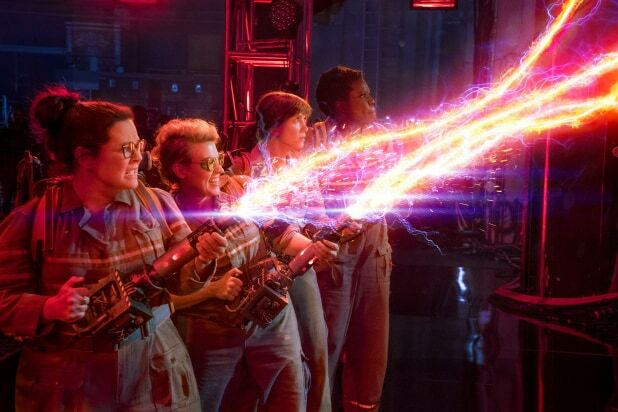 Outside of social media, the trailer is also criticized for Leslie Jones' character, Patty Tolan, who worked as an MTA worker before joining the Ghostbusters, while the other women have scientific backgrounds. A Fusion article calls Patty's presence in the trailer a "minstrel show." Jones replies in a series of tweets: "I'm playing a hardworking woman.The regular one that rep the people. ... You guys are the racists by labeling her a lowly MTA worker." April 27 -- Sony releases a featurette focusing on Hemsworth's character. It receives 2,000 likes and over 4,000 dislikes on YouTube, with comments decrying the film for portraying the male receptionist as a stereotypical dumb but attractive blonde. May 16 -- YouTuber James Rolfe, who did several "Ghostbusters" retrospectives for his website, CineMassacre, releases a vlog explaining why he will not be seeing or reviewing the new film. The vlog gets media attention and becomes the subject of jokes on Twitter. Among those who joked about Rolfe's video was comedian Patton Oswalt, who tweeted, "I really wanted to hate this Cinemassacre GHOSTBUSTERS review but I'm such a fan of noisy, thick-saliva swallowing it won my heart." In response, Oswalt received tweets mocking the death of his wife, Michelle McNamara, who passed away a few weeks prior. June 8 -- The casts of the original and new "Ghostbusters" appear together on "Jimmy Kimmel Live." When asked why he chose to be a part of the reboot after holding out on returning to "Ghostbusters" for so long, Murray said, "It was only because I knew these girls were funny." June 23 -- Fall Out Boy releases a cover of Ray Parker, Jr.'s "Ghostbusters" theme that will be used in the new film. The song, which also features Missy Elliott, receives largely negative reviews. July 9 -- "Ghostbusters" holds its world premiere at the Chinese Theatre in Los Angeles. The film scores 73% on RottenTomatoes, with TheWrap's Robert Abele praising the cast for its comedic delivery while criticizing the film's CGI-heavy third act. July 18 -- In the days following the film's release, Jones began receiving racist abuse on Twitter, including pictures of apes. "I leave Twitter tonight with tears and a very sad heart," Jones wrote. "All this cause I did a movie." A day later, Twitter bans Breitbart writer Milo Yiannopoulos for terms of service violations. Yiannopoulos was accused of posting tweets that encouraged harassment against Jones, including screenshots of tweets falsely attributed to the actress. August 24 -- Jones' personal website is hacked to display personal information, including her drivers' license and passport, as well as explicit photos of her and a picture of Harambe, the gorilla that was put down at the Cincinnati Zoo earlier this summer.